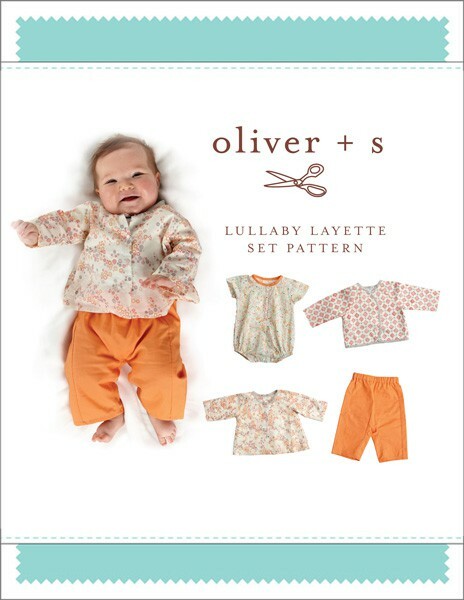 Share your photos on Instagram with the hashtags #lullabylayette and #oliverands. Bodysuit/Shirt Chest* 19" 20" 21" 22" 23"
Pants Hip 22" 23" 24" 25" 26"
Jacket Chest 22" 23" 24" 25" 26"
I Love this pattern-made a sweet layette for my little daughter. 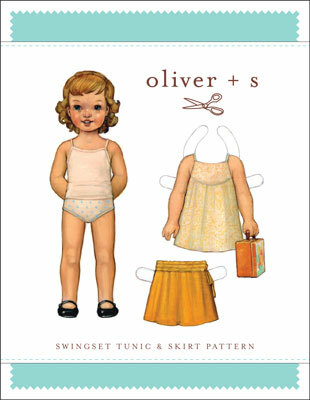 I adore Oliver and S patterns! Clear instructions, great design highly recommend!! So far I've made the jacket in a quilted cotton and linen. Such a gorgeous design, and clear and straight forward instructions. My sister remarked she'd like one in an adult size! I just made the bodysuit in a double gauze for my new granddaughter. It's a perfect piece for warm summer days.The instructions were very clear. I made the 0-3 months size and it's a little short now that she's about 10 pounds. I will definitely make it again in a larger size for next summer. Excellent instructions, sweet patterns, this is really adorable! Adorable — that’s how my sixteen year old grandson described the layette I made using this pattern! The instructions are terrific, the designs simple and modern. A winner! Love them well put together, well designed, a lovely collection and good value. I just finished the jacket using a bamboo knit/double gauze type fabric and it's such a fun little garment to sew! I didn't use a lining as the fabric is quite heavy. I finished the jacket with a bias binding. It was a fast and straightforward project, and I'm hoping to find time to sew the other items for a friend's baby due in June! I bought this pattern to make items for my first grandchild due in December 2017. I printed it all out and taped it together. In the mean time I decided to make 3 sets of the trousers for triplet grandchildren of a friend. As the fabric is quite thin, I have lined them with cotton jersey and they look good. Appreciate the extra width in the back to accommodate the nappy. The plan is the have turnups instead of hems and I am wishing I had added a bit to the length. Will do that next time. I've made all the designs in the set and am delighted with all of them. One point, in the illustrations for the jacket: if these could distinguish between the lining and the main fabric in the picture where they are first joined, it would save some late night head scratching for the spatially challenged. Otherwise very clear and I will use these patterns many times. I've made the pants, two onesies, and am in the middle of the jacket. They have been a lot of fun to make and the finished pieces look great! I slightly modified the second onesie to add bias to the sleeve and looks great. I plan to make a second jacket using a flannel, will be interested to see how it works with fabrics other than quilting cotton. I love making these as a set to give as a newborn baby gift. It's fun to use up leftover fabric and match different prints and solids for each set. I could just keep on making this pattern repeatedly because the finished product is so satisfying! 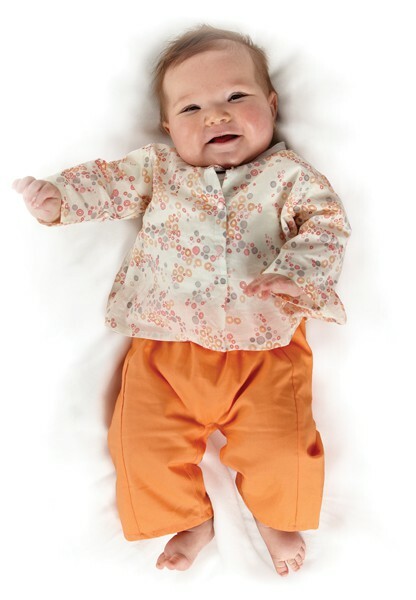 Another wonderful pattern by Oliver + S. This layette is so cute and the options are extremely tempting. The instructions are easy to follow. I have had success with every Oliver + S that I have used. I made the bodysuits and jackets in liberty and double gauze (jacket lining) as wedding outfits for my twins- they came out beautifully. 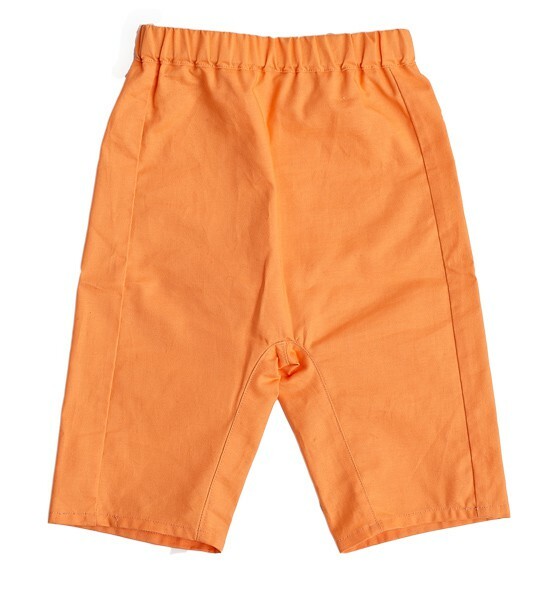 I also made the pants and they are quite big/high- which is a bit odd since the smallest sizes of jackets and onesie fit perfectly- probably a better fit on older babies or those with cloth diapers. Still, Oliver and S patterns are the best and you always learn something new! I made the bodysuit with a matching jacket as a baby shower gift and then, just for fun, I made another bodysuit using some upcycled cotton lawn from an old sundress. So fun to make, with such clear instructions. Rather like having a nice sewing teacher sitting with you while you sew. I used Liberty cotton for the bodysuit/jacket lining and a little piece of Cone Mills stretch denim from the stash for the outer jacket. Wonderful pattern! So far I have only made the jacket but, as with all Oliver + S patterns, the directions are thorough and clear to follow and the end result is professional. I have learned so much about garment sewing from the patterns I have purchased from Oliver + S and am an evangelist for their brand! I had been looking for an infant jacket pattern with raglan sleeves and was so happy to find this one! So far I've made the jacket and plan to make matching pants. I made the jacket with heavier material than called for - a brushed fabric on the outside and fleece on the inside - and it came out great! No problems at all with heavier fabric. Looking forward to making the pants and trying other patterns in the future. I L-O-V-E this pattern!!! So far I made the shirt & pants. The directions are so easy to follow. I adore the modern style and will use it again and again! Made three onesies for 3-6 months. Had some questions about applying the binding, was so impressed with the immediate response and attention to detail in replying to my question. Felt it was great customer service, and was happy with the results. Went ahead and then made the jacket and pants. All turned out great. Will use the pattern again and again. I've used this pattern to make three pairs of pants, two shirts, two jackets, and one bodysuit so far and have been happy with the results. I'm so glad that I bought this one! This pattern is wonderful! I used the suggestion from the blog and quilted the fabric for the jacket. I made the bucket hat and bubble dress to match! Sooo cute! I will be using this one a lot! Perfect set for baby gift! I own a fabric shop and have sold this pattern again and again--I have a cute sample of the jacket hanging that can't be denied! It's so easy to make for how great it is. Perfectly gorgeous and really easy to make! This pattern set is fantastic! I have so far made the bodysuit in two sizes as well as the pants. Both patterns have great sizing and go together perfectly. Simple patterns with great instructions and a few different techniques to keep it interesting and professional looking. All of the pieces have been given as gifts and the new mums are just delighted! I am due myself in a few months and my baby will live in pieces from this layette set 24/7. Recommend to every sewist for the little people in their lives! This would have to be one of the best baby patterns anyone could wish for....I found everything easy to follow.....the instructions are detailed and the finished product looks fantastic. I especially love that you can use woven fabrics to make the onesie. Will be making these items many more times. Fabulous pattern. Goes together easily and quickly. Love how the jacket is constructed. The pants are easy enough for a beginner. Very cute. So far I've only made the jacket and the pants. It makes the perfect outfit for a little baby. It's not hard to make and very quick. Easy to follow pattern - cute suit! Just made the onesie out of grey flannel for my baby boy. It is super cute! Overall I was very impressed by the directions and ease of following this moderately complicated pattern. The one thing that was missing was more detailed instructions for finishing off my interior seams. Not sure how I would have done that without a serger. A perfect addition to the O+S family, and yours! I cannot say how delighted I was when this pattern was released, being 12 weeks pregnant at the time. There are a lot of knit romper patterns available (very hard to get a professional look with knit) there are a lot of traditional baby rompers available ( lots of smocking, very bloomy) but this is the perfect mix of both. It sews up in a woven, thus enabling great results, but it is not too puffy so it is very suitable for sweet baby girls or boys. 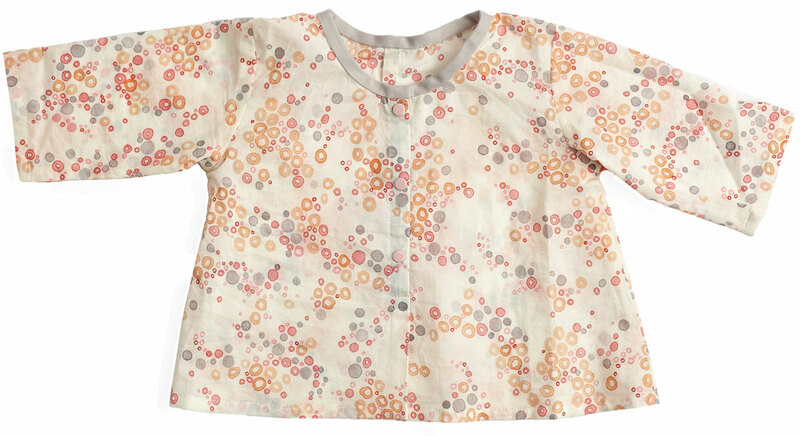 The tab front makes dressing wiggly babies a breeze and the trousers easily cover a cloth nappy, no need to size up. I think the blouse could use a extra inch length added, but that is just my personal taste. The jacket is fab, one of those Rock Star projects, when you think 'I made that'? Perfect for gifts, perfect for your baby. Just perfect. I used unusual colors. Along with the easy to follow pattern I turned out each set x3 and they are lovely! such a well-crafted pattern and directions! this was a breeze to sew with the well-written directions. Particularly love the styling of the pants and the way the jacket is assembled -- can see many variations and cute outfits with these basic pieces. 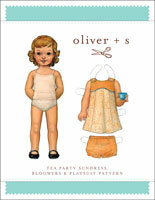 Love the Oliver + S patterns - and just had to grab this one hot off the press! Perfect for all little ones! This is my go-to pattern for all of the babies in my life. I absolutely LOVE the jacket. it is a piece of cake to make and can be made with the binding or without. The pants are perfect and cozy. They are loose enough that they would be comfortable lined with fleece or flannel for warmth. The seems on the pants are really cute and different, as they do not sit on the sides, but rather more toward the front. Instructions are detailed and perfect as always. 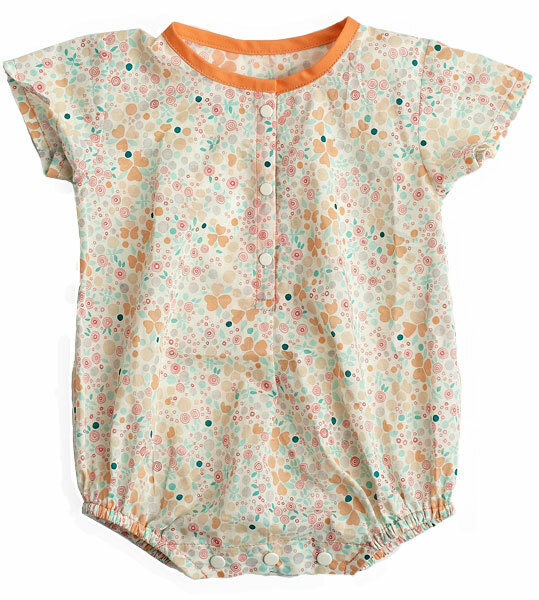 The onesie and blouse are added pieces to create a lovely layette. There was a minor error in the first printing of the instructions for this pattern. 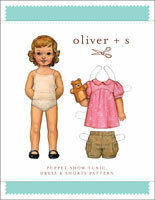 On the first page of the instructions, step 1 under Getting Started should begin, "For View A only, cut...."
Bodysuit Length 14" 15 1/2" 17" 18 1/2" 20"
Discussion on the lullaby layette set sewing pattern from the Oliver + S Discussion Forums. Find and share more photos on Instagram using the hashtags #lullabylayette and #oliverands.